is located in the heart of Munich at Theatinerstraße – a short distance by foot from Odeonsplatz and Marienplatz. 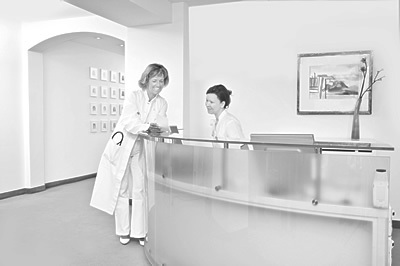 Dr. Gergelyfy provides her patients with comprehensive and personal care for all problems related to internal medicine. Medical experience, knowledge of human nature and the famed „gut feeling“ are perfect prerequisites for establishing a sound diagnosis: prior to setting up her own practice in early 2009, Dr. Gergelyfy worked at acute care hospitals for many years in different areas of specialisation associated with internal medicine. Thanks to her numerous additional qualifications, she refers to herself as specialist for internal medicine with medical all around vision and focus on out-patient care. Nutritional medicine is an important part of her activities as a personal physician. Aside from general nutritional advice, the adiposity management using gastric balloons is part of her areas of specialisation. With an average of 3 to 4 gastric balloon implantations a week, she is one of the leading capacities in Germany. Another focus is on general medical check-ups which include all main organ systems and for which the specialist for internal medicine is applying her extensive experience in ultrasound imaging. Dr. Gergelyfy is an expert in this field and has been organising high-quality ultrasound training courses in cooperation with the Bavarian State Board of Physicians for 20 years; she is often consulted by peers for a second opinion. 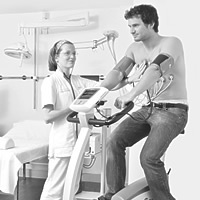 The performance range of Dr. Gergelyfy is rounded off with the rheumatologic intensive care of patients. In all aspects of her field of expertise, Dr. Gergelyfy attaches great importance to the interdisciplinary exchange with colleagues working in related areas of specialisation. Dr. Gergelyfy is exclusively treating private and self-paying patients because she wishes to spend extra time for in-depth discussions with her patients, the necessary diagnostic procedures and customised treatments.